Plagiocephaly is a head shape deformity that affects a considerable number of babies. As so many babies are affected by this it’s good for parents to know how to identify the condition. Parents usually notice that their baby’s head shape ‘just doesn’t look right’ and although most health care professionals will only measure the circumference to make sure that the head is growing as expected, it’s unusual for them to quantify the head shape deformity by using measurements. This post identifies how parents and clinicians can measure the head to identify that a baby has plagiocephaly. Although many parents are becoming more aware of plagiocephaly, it can be difficult to know what to look for. At around eight weeks of age it becomes obvious to parents that their baby’s head is developing a flattening and plagiocephaly is characterised by a flattening to one side of the back of the head. In more severe cases, the baby can have ear, brow and cheek misalignment on the same side as the flattening. If you have visually identified a flattening on your baby’s head, the next step is to assess the severity of the flattening and know how to proceed. Mild cases of plagiocephaly will improve enough to be un-noticeable if your baby younger than 4 months of age. More severe plagiocephaly will often require treatment to correct it. Keep reading to find out how to identify the severity of your baby’s flat head syndrome yourself and how our professional clinicians will accurately measure it and recommend your best options to improve the shape of your baby’s head. Although parents don’t have access to the same equipment that our clinicians have, there are still some techniques that allow parents to identify their baby’s plagiocephaly themselves. At Technology in Motion, we have developed a severity scale to help you to visually recognise the severity of your baby’s head shape. The application allows you to upload a picture of your baby’s head from above, and find the closest matching head shape to your own baby’s. Using this app, you can get an indication of how severe or mild your baby’s flat head syndrome is. Clinicians will be able to assess whether or not your baby has plagiocephaly by simply looking at their head shape, but to assess the exact severity of the condition, they use a piece of equipment known as a craniometer. Craniometry is the measurement of the cranium; in other words, the skull. A craniometer can therefore help professionals to measure a baby’s head, and doing this helps clinicians to identify any asymmetry. Using a craniometer, medical professionals measure the diagonals of a baby’s head as the image above demonstrates. The two diagonals are measured from outer edge of the eye to the opposite high and low spots at equal angles. Once these measurements have been taken, a specialist will work out the difference between the two measurements. The diagonal difference determines whether your baby has a normal head shape or if the plagiocephaly is mild, moderate, or severe. Another, more visual way of classifying plagiocephaly is shown in our Argenta scale. This is a reliable and validated tool used to classify the severity of head shape deformities, covering both plagiocephaly and brachycephaly. The Argenta scale divides plagiocephaly into different severity classifications from 1 to 5. These are shown in the above diagram. At Technology in Motion, we have years of experience in identifying plagiocephaly and finding the best treatment option. If you have believe that your baby has a flattening, or have used our assessment app to recognise that they have, our clinicians can officially measure the severity of the condition and advise accordingly. 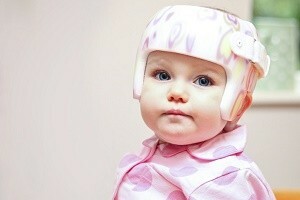 It is unlikely that severe plagiocephaly will correct itself without an aid, such as our innovative TiMband. Do not hesitate to get in touch to book an appointment at your nearest clinic.